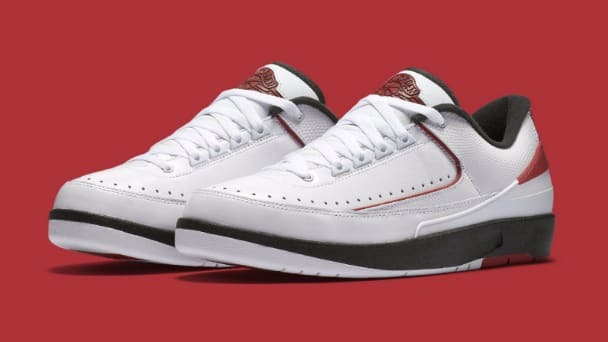 As much as I think the Air Jordan 2 silhouette is under-appreciated, Jordan Brand has gone a bit off the rails with trying to make the Air Jordan 2 Low more popular among the masses. This time around, they’ve gone and chopped the ankles of the ‘Chicago’ colourway (can’t go wrong with varsity red/white/black on any Air Jordan) and given us a sleek low-cut model. A mainly white upper with varsity red highlights on top of a black sole, it’s a nice looking shoe, but they just need to pump the brakes a little here. A premium leather Air Jordan 2 Low would’ve been a better bet. Or even better – BRING BACK THE MELO 2!